This is an incredibly simple dish and popular in the villages especially, in the cold winter months. 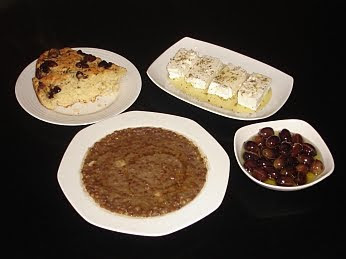 It is not so much the lentil soup that is so enjoyable as the whole meal with the accompaniments - feta cheese covered in olive oil and sprinkled with oregano; olives and bread, ideally olive pitta bread - see the photo above. The recipe for olive pitta bread is here. Rinse the lentils well in a colander under running water. Put them in the pan with the onion, garlic, bay leaves and oregano. Add enough water to cover them plus another 2 fingers approx. above them. Bring to the boil and then simmer for at least 1 hour or until the lentils have become very tender. When ready, add the oil, salt and pepper and stir. Lentils are so good for you, and so inexpensive. I love the ingredients you've used in this dish. Do you add the accompaniments to the dish as in gazpacho, or eat separately? 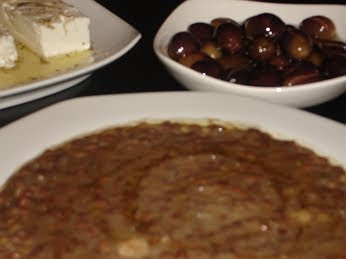 Sheila - they are separate, as in the photo and you eat the cheese and olives as you are eating the lentils. You can also use the olive pitta bread to dunk in the lentils as you are eating! I love lentil soup and have not had it since my Mom passed away. She made the most delicious soups. Thanks for posting this recipe. Dear symposio --in our Greek household growing up we loved it. But we either added fresh chopped tomato or canned tomatoes and some times cut celery. Not a deal maker but the Greeks like to add a little of this and a little of that.